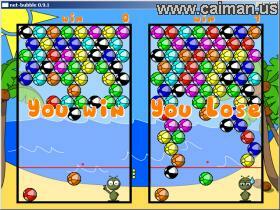 Caiman free games: Net-Bubble by Samuel Marin, Cecile Hayez, and others. A real nice Bubble Puzzle clone (single or multiplayer). 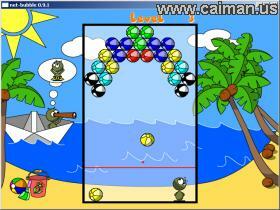 You aim your cannon to shot at the bubbles which have the same color. When you hit and connect 3 or more bubbles, these bubbles and any underneath fall off the screen. You preceed to the next level when there are no more bubbles remaining. Gamepage at author's site . Mirror download (funbude.de - no install) 2,52 MB.